This post reviews recent controversy over some strange theories of Pat Frank. It reviews his WUWT posts, blog discussion, some obvious errors, and more substantively, how error propagation really works in solution of numerical partial differential equations (pde, as GCM climate models are), why it is important, and why it is well understood. It's a bit long so I'll start with a TOC. GISS October global up 0.1°C from September, now 0.9°C. 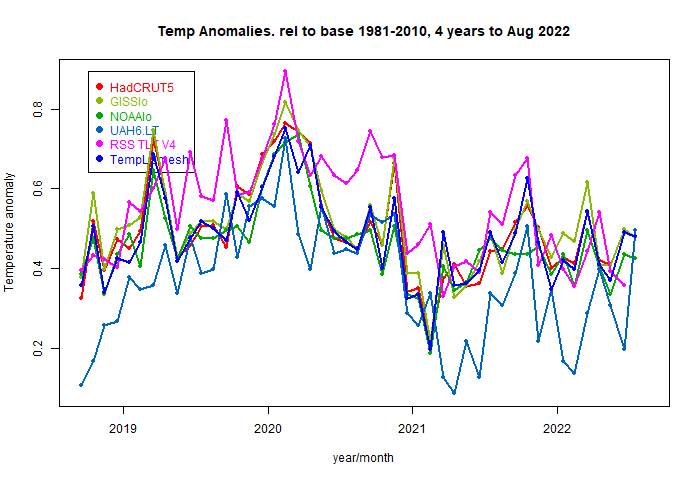 GISS warmed, going from 0.80°C in September to 0.90°C in October (GISS report here). That is very similar to the increase (now 0.105°C) in TempLS mesh. It was the second warmest October on record, after 2015. It is interesting to reflect on that month two years ago, which at 1.04°C was at the time by some margin the warmest month ever. The overall pattern was similar to that in TempLS. Even warmer in Antarctica, cool in W US, and E Mediterranean, but the band of cool through to China is less continuous. 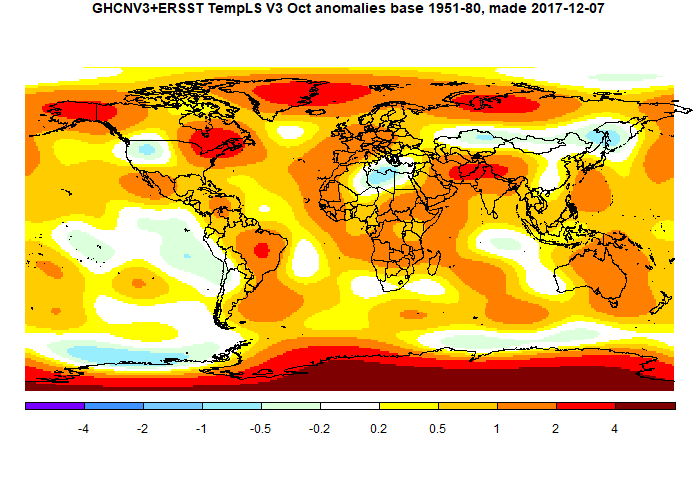 TempLS mesh anomaly (1961-90 base) was up from 0.618°C in September to 0.73°C in October. This compares with the smaller rise of 0.055°C in the NCEP/NCAR index, and a similar rise (0.09) in the UAH LT satellite index. The anomaly pattern was similar to the NCEP/NCAR picture. No great heat, except in Antarctica, but warm almost everywhere. A band of cool between the Sahara and Far East Russia, cool in the SE Pacific, and some cool in the western US. The change toward warmth at the poles will again lead to varying results in the major indices, with GISS likely to rise strongly compared with NOAA and HADCRUT. In fact, TempLS grid, which also has less coverage at the poles, fell slightly to October. Overall, sea temperatures rose a little, after dropping last month. Roy Spencer noted the recent marked rise in the satellite records, which are now relatively a lot higher than the surface. I'll show (from here) the graph of the last four years on a common 1981-2010 base. Even UAH, which had been a low outlier for most of the time, is now well above the surface measures, and is not far below the 1998 peak. In the Moyhu NCEP/NCAR index, the monthly reanalysis average rose from 0.317°C in September to 0.372°C in October, 2017, making it the warmest month since May It was again a very varied month; starting cool, them a warm spike, and cool again at the end. The main feature was a big cool band from the Sahara through Siberia to China. Also cold in the SE Pacific, with some La Nina like pattern. Mixed at the poles, but more warm than cold. Since Antarctica was cold last month, this suggests the warming will be reflected more strongly in GISS/TempLS rather than NOAA/HADCRUT. My initial commentary was a bit confused, mainly because we have recently had NBN (a new optic fibre system, much complained about) installed, and it kept disconnecting from the internet. However, I loooked into it a bit more and found quite a lot of history. 2017 Time report on how it even got to Trump's desk, supplied by senior aide K.T.MacFarland, now US ambassador to Singapore. The Politico story about the Trump occurrence. The actual Time 1977 cover is here. Goldstein is of course talking nonsense about the forgery being a plant designed to pick up on the 1977 Big Freeze cover. That cover wasn't about global cooling at all. It was a straight forward factual article about a very snowy winter in 1976/7 in North America. There was in fact a 1974 Time article on global cooling that people might have wanted to look up, as the Time link describes. But there was no cover associated with that, although the contrary is widely believed. David Rose at Daily Mail, "Great Green Con". 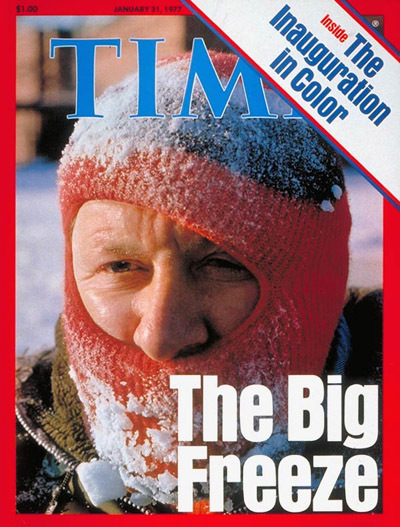 See the blue box which says "In the Seventies, scientists and policymakers were just as concerned about a looming ‘ice age’ as they have been lately about global warming – as the Time magazine cover pictured here illustrates. The picture has now been removed without explanation, which doesn't help the clarity of the text. There clearly was more history, since most of these don't have the 1977 pasted over as in the Time/Kirtley versions. So I did a bit more searching. Steven Goddard, 2011 is an old reliable. This predates 2013, so clearly debunks the Goldstein fantasy about Time forging its own cover in 2013. Neocon Exresss is the earliest nominal date, at Feb 12, 2007. But that predates the real cover, so I presume the image was added later. Of interest is a Jan 2011 comment, drawing attention to the fakery.